There will be an edible theme to this Easter’s Bloomin’ Kids gardening workshops. Whatever the weather, children as young as five can get gardening at the free workshops on 9 and 11 April. 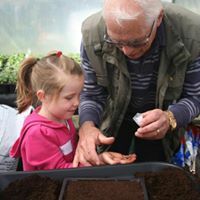 Taking place in Farnham Town Council’s greenhouses, children will have the chance to get stuck into sowing broad beans, beetroots and peas and potting on tomato and basil plug plants as well as participating in an arts and craft activity. Iain Lynch, Town Clerk at Farnham Town Council says: “In school holidays, it’s great for parents to have an activity up their sleeves that doesn’t rely on good weather. Our gardening workshops are free and will keep you and your budding young gardeners busy for a few hours. There are two sessions on each day on Tuesday 9 and Thursday 11 April. Parents can opt for a morning or afternoon session. Bookings can be made online. Activities are suitable for children aged five and over. Parents or carers are required to stay with their children throughout. Refreshments are provided and limited toilet and parking facilities are also available. Bloomin’ Kids is part of Farnham in Bloom and aims to get children and families involved in the project and help them enjoy the benefits of gardening. The workshops are held in the council’s greenhouses which are located on West Street between the cemetery and the allotments.